The sexually transmitted disease (STD) syphilis is usually diagnosed with serologic testing. Although darkfield microscopy can identify spirochetes in fluid obtained from lesions of primary syphilis, the test has many false-negative readings, and many physicians are not trained to perform these tests. PCR for Treponema pallidum DNA is now commercially available for diagnosing early syphilis, with early reports showing good sensitivity and specificity. The major serologic tests for syphilis are the nonspecific nontreponemal Venereal Disease Research Laboratories (VDRL) and rapid plasma reagin (RPR) tests, which measure antibody production to a car-diolipin-cholesterol-lecithin antigen, and the specific trepo-nemal antibody tests, which measure antibodies against the spirochete T. pallidum. The usual screening for syphilis is a two-step process, beginning with the RPR or VDRL test, followed by treponemal antibody testing for confirmation. The RPR or VDRL is reported as a titer of the highest dilution giving a positive test. The VDRL usually becomes positive approximately 1 to 4 weeks after the development of a chancre. The highest titers of nontreponemal tests are seen in secondary syphilis. The sensitivity of the RPR or VDRL is 78% to 86% in primary syphilis, 100% in secondary syphilis, and 95% to 98% in latent syphilis. Titers of VDRL or RPR parallel disease activity. 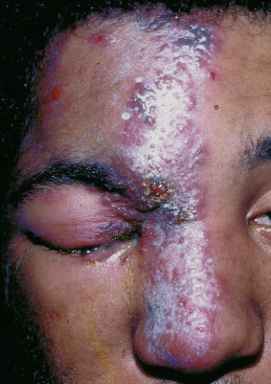 After appropriate treatment of primary or secondary syphilis, titers decline and usually become negative within 1 year. A fourfold decline in titer 6 months after treatment suggests an adequate response to treatment of primary or secondary syphilis. A fourfold rise in titers after treatment suggests reinfection. Low titers may persist after treatment of late and latent syphilis. Approximately 20% of nontreponemal screening tests are false positive; false-positive tests usually have titers less than 1:8. Causes of false-positive nontreponemal tests include autoimmune disorders, HIV infection, infectious mononucleosis, endocarditis, and lymphoma. The treponemal tests, such as the fluorescent treponemal antibody absorption (FTA-ABS) test or T. pallidum enzyme immunoassay (EIA), are used to confirm infection in a patient with a positive nontreponemal test. The FTA has a sensitivity of 84% in primary syphilis and almost 100% in other stages of syphilis. The specificity is 96%; approximately 1% of the population has a false-positive treponemal antibody, and it is not routinely used for screening. The trepo-nemal tests are reported as positive or negative. Treponemal tests remain positive in 95% of patients, even after treatment, and are not used to monitor treatment response. In neurosyphilis, cerebrospinal fluid (CSF) abnormalities include elevated protein, a lymphocytic pleocytosis, and a positive VDRL. The CSF VDRL is the preferred test because it is more specific than the CSF FTA. However, the sensitivity is low enough that a negative CSF VDRL does not rule out neurosyphilis. In congenital syphilis, the diagnosis can be difficult because both FTA and VDRL antibodies can be transferred passively to newborns, and their identification at birth in the baby does not necessarily indicate infection. Passively transmitted antibodies generally decline in the first 2 months of life. If titers rise after birth, congenital syphilis is likely. Testing using specific T. pallidum EIA IgM may allow earlier diagnosis of congenital syphilis.